It was my local chapter of the Alzheimer’s Society Canada that first introduced me to day programmes. The brochure was just another among the many I received. No need to digest it yet. The Adult Day Programme was for ‘later’ when my Bert was much further along in Alzheimer’s world. It never occurred to me that I might need it as much as he did. I felt so very guilty. Even the caregiver’s mantra: “It is not my loved one, it is the disease,” did not work. This was my Bert really telling me that he loved me. It was the disease that resulted in the incessant repetition. He really did not remember that he had asked me the question five minutes before. Coupled with this was the intense ‘shadowing’. I felt claustrophobic. HELP! Yes, I needed some respite. So I went through the detailed process and registered at the local Day Programme. The wait list was nine to 18 months! Could I survive? I did, and it was worth the wait. Yet, when my sanity saving call came I panicked. What will Bert do without me for six or seven hours in a day? This is my paean to the providers and staff of adult day programmes everywhere. My greatest appreciation is that day programmes are for both patient and caregiver. Two days per week from 9 a.m. to 4 p.m. my Bert is in a non-judgemental environment of acceptance where he is both mentally and physically stimulated. He is socially engaged in programmes designed specifically for adults with dementia. Bert is with professional staff and volunteers of the highest calibre who care with love. He receives a hot, well balanced lunch and snacks. The staff will tailor the activities to suit the capabilities of the group and at times to the individual. Music, art, Tai chi, games, crafts and relaxation time, one on one conversation and hugs are all on the agenda. It is a cheerful atmosphere, each one called by name and greeted with genuine warmth. 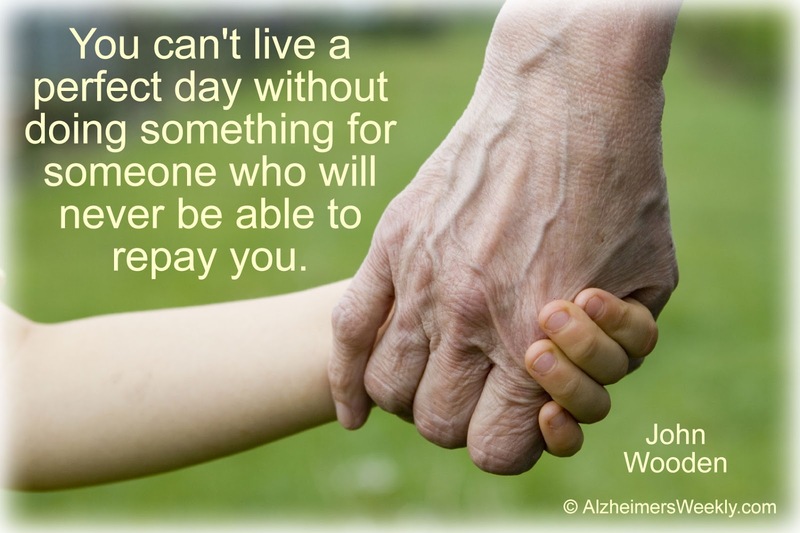 For the caregiver, in addition to the benefits for your loved ones are the benefits for YOU. As a caregiver I can get to medical appointments, do chores, go to the hairdressers, shop, have a coffee with friends, play Mah jong, read, keep in touch with friends via telephone or email and go the bathroom without worry and without my shadow. I can breathe. What a luxury to have a little time for self. Now I do not have to fight world war three to get my Bert ready for his ‘club’. On delivery he gets four kisses that say he will see me at 4 o’clock. The greeting staff member may count along. Some days he is laughing when I pick him up. Some days the anxiety is there. He loves his club but he loves me more. He is so happy when he sees me. Thanks to the day programme I am happy to see him too. The Meander: Many times you will get the question: “How do you do it?” Best answer: “With a lot of help”. Getting your loved one into an Adult Day Programme is among the best help you can get. A good adult day programme is an environment of acceptance providing care and support for both patient and carers. For a little while you can get away from living in Alzheimer’s world. “You know what?” “Guess what?” Yes, still it comes, but I no longer count! We were all excited. Next port was Mauritius and we had decided that one stop we had to make was to the Museum of Natural History to see the only complete Dodo bird in existence, stuffed of course, as the last reported sighting of this extinct bird was in 1682. We were a small group of world cruisers who in no time had become as thick as thieves. “The dodo is in the Museum of Natural History right downtown Port Louis. It is in a park. We can take either a water taxi or land taxi into town.” There was some joshing as they were used to my having a modicum of knowledge on ports and sights. The fact is that I go, and listen, to port talks. “I agree. I think we have to go the land taxi route. At the port talk there was a woman who has been here before explaining that getting out from the water taxis can be dangerous and involves climbing vertical iron steps.” I reminded them. We opted for the land taxi. The drivers were not the most hospitable bunch as each one demanded we take a tour before being dropped off in town. We finally settled on a tour costing $20. The tour was worth it. Mauritius is quite beautiful but you have to go away from Port Louis to see that. Once we left the port area and started on the road which wound between sugar cane plantations, up to the beautiful church on the hill and drove into the country we were pleasantly surprised. We drove by the City cemetery, library, Hindu Temple and various consulates. But the dodo was our objective and soon we were dropped off in town near the park gates. Our driver/tour guide told us how to find the museum. “I wonder why we say as dumb as a dodo?” Jay asked. For the first time our driver smiled. “Because they are stupid and look stupid too!” he exclaimed as he drove away. The museum exhibit cleared that up somewhat. Apparently the Portuguese named it ‘doudo’ which means ‘fool ‘or ‘crazy’. But the dodo is also to blame for its name. They were not used to humans so when the first settlers came the dodo were fearless and also curious. They went up to greet these strange new creatures. The Dutch, who were the first settlers looked at these fat funny looking flightless birds and saw MEAT! The hungry Dutch sailors and first settlers ate them to extinction. That is a popular theory. The more reasonable and scientific explanation is that the rats, cats, dogs, pigs, goats and deer brought to the island by the settlers contributed greatly to the dodo’s extinction. The dodo was meat for one and all. There is an entire gallery devoted to the dodo which is the national bird and which you see on stamps, clothing, souvenirs of every form, coins, buildings, and a very colourful statue of the dodo in the park. Mauritians are very proud of their museum and of this bird which is synonymous with extinction and obsolescence. We left the museum transitioning from the somewhat ridiculously sublime to the ridiculous as after only a few steps to the market we came upon outlet stores for Hugo Boss and Ralph Lauren. We knew that both these companies had factories and ergo outlet stores here in Port Louis. Here they were. Eureka! Jeans from Hugo Boss! T-shirts from Ralph Lauren!. Buy, buy, buy at some ridiculous prices too. That night on board ship, as we rehashed the day we decided that seeing the stuffed dodo in Mauritius was not a bucket list item but rather a ‘bragging rights’ travel story. What’s the difference? We toured Port Louis, Mauritius and the Museum of Natural History on March 30th. Just six weeks prior we had attended the opera at the Sydney Opera House, Australia. Now THAT was an item on all our bucket lists! Which would you choose for your bucket list? The Meander: Travel to discover. It is an education. I do not believe that the Mauritius Museum of Natural History appears on any top ten list of museums. However, read about the history of Mauritius and about the extinction of the dodo and you cannot help but think about how man can and does encroach on nature with devastating results. The Dodo did not stand a chance. To men who are caregiver mothers to wives, mothers, fathers, siblings, grandparents, friends, partners. Today, I want to be mother to all caregiver mothers, to embrace you, to give you hugs, to let you know that as a caregiver mother I do know the sorrow, the joy and love of being a caregiver mother. Here’s to another perfect day of doing and an infinitesimal token of appreciation for all we do. The Meander: Every week I look forward to receiving the Alzheimer’s Weekly & Dementia Weekly Newsletter. It is filled with information on the many forms of dementia, new research, caregiver support and ideas to ease our special journey. It links to other publications and organizations. Each issue begins with a Thought for the Week similar to the one reprinted above. I must confess that in addition to the articles I do look forward to these gems with anticipation. Author PaulaPosted on May 13, 2018 Categories Alzheimers, Meanderings, Script StreamsTags #caregivers support, #dementia, #living with Alzheimer's diseaseLeave a comment on For Caregivers: All Mothers! My foot was elevated on a stool, cushioned by a pillow. The entire leg was swollen with the knee looking suspiciously like a substitute for a basketball. The ice pack was enclosed in a small towel resting on the knee. The pain was, well I have given birth so I will not say it is the worst I have experienced but it comes a close second. Everyone says exercise is so very good for you. In my case exercise is hazardous to my health. My used to be dear friend chortled and proclaimed: “You are the only person I know who could bust up a knee slipping from a stationary exercise bike.” That is true. I did not fall off. One well shod, sneakered foot slipped out of the stirrup and all my voluptuous avoirdupois went onto one leg and landed me in painsville. “Baker’s yeast?” I asked incredulously. “No, no, it is called Baker’s CYST”. I had never heard of this. She told me she would be referring me to an Orthopaedic surgeon and in the meantime I was to follow the RICE formula. I was surprised how many people knew about Baker’s Cysts, how many had had it or knew people who had. I had read up on it and was praying that it would heal itself as can and does happen. One acquaintance gleefully informed me that she had had the needle aspiration and showed me the length of the needle that in my apprehensive state seemed to be at least a foot. Yikes! Out of curiosity, I look up R.I.C. E. on the internet. I finished falling off my chair as in the middle of explaining the first aid procedure the next heading in the stream was varieties of rice; It informed me that in the US long grain rice is used for boiling, quick cook products and soup; short grain for cereals, baby food, beer and liquors. This was followed immediately by ‘do not put ice directly on the skin’ then without skipping a beat or establishing a discernible logical connection the next heading was Inflammation fighting foods which did NOT include rice but had broccoli and wild caught salmon in the mix. I thought, here is a complete dinner and was feeling quite full and drunk too from the long grain liquor when I was suddenly brought back on topic by the next heading: what is rice used for in first aid and was back to athletic injuries and the formula. You just cannot make up stuff like this. The Meander: Our intrepid Jim has suggested Jay and I do a skit or work on a routine for You Tube. Jay is wondering if my rice formula is holistic. I want to know if the bananas and rice is served as a smoothie. We are all having fun with this….that’s GOOD!